Authentic piece or a fake? Johanna Eggers’ daily task is to investigate just this. Born in Hamburg, Johanna manages our REBELLE brand check and is responsible for guaranteeing the authenticity of each designer item. In an exclusive interview with us, Johanna reveals how she distinguishes an original from a fake, whilst also telling us about her other day-to-day tasks at REBELLE. What does a Brand Expert, at REBELLE do exactly? I manage the brand department at REBELLE. This means, I am responsible for the authenticity of any items that are sold through us, the price recommendations, as well as defining the range of designer brands we stock on the site. I love that I am able to work with unique designer treasures every day! I am fascinated by vintage pieces and I find it really exciting that each new product takes me on a trip back in time through the world of fashion. Our product range is very diverse; you can find anything from a Louis Vuitton case from the 1920’s to a Fendi Peekaboo handbag from the current collection. Some of these pieces are like a little bit of history and sometimes reveal information relating to the former owner. This could be a shopping list, an old passport photos or even a love letter. If I feel that this has some sort of sentimental value, I will send it back to the person who sent it. Where did you get your experience and expertise from to carry out the authenticity checks? I have almost ten years of professional experience learning about brands and their specific features and have a strong personal interest in this area, as well. There is no formal academic training or programme to become a brand expert. Learning on the job is the only way to get experienced. I’m also in constant exchange with leading fashion houses about new trends, designers, collections and authenticity features. It has become such a passion, that – even outside the office – I often catch myself checking women’s bags for their authenticity as they pass by, without having being asked to do so. How do you distinguish an original from a fake, and how do check it for authenticity? Every designer and model has different features; these help you to determine whether or not the item is an original. I tick these features off my mental checklist one by one. For example, the first thing to do when it comes to clothing is to have a look at the label. Does it match the designer’s style and brand design? Was it sewn in afterwards? For bags, on the other hand, the first thing to check is the feel. Just by touching it and feeling its material, I immediately know whether the bag is authentic or a fake. In addition to that, I also check the date code, the brand font, metal elements, the zip, how the zip fastens, and the seam of the bag. And a good indicator is also whether the bag’s features match its age, as specific brand characteristics can change over time. What should you look out for when purchasing an expensive designer vintage handbag in order to avoid buying a fake? I would always recommend making your purchase via a market leader such as REBELLE or generally making purchases via resellers that have an expert team, who physically check the item. Buyers should inquire about the designer piece’s authenticity features before making the purchase. You should be suspicious if the item is offered at an unusually low price. For example, a Hermès Birkin bag for 1.000€ is guaranteed to be a fake, as the price for a second- hand bag of this type, depending on the condition and signs of wear, is at least six times this amount. Nowadays I wouldn’t solely rely on accessories or a bill, as these items can be faked just as easily and often surprisingly professionally, too! "Our customers can absolutely rely on the authenticity of designer pieces sold through rebelle.com." What happens if you come across a fake item at REBELLE brand check? We have a zero tolerance policy, when it comes to fake merchandise. As soon as an item does not meet one of the required features on my checklist, the item is rejected and sent back to the seller. Can you issue customers with a certificate regarding the verified authenticity of the item? Our customers can absolutely rely on the authenticity of designer pieces sold through Rebelle.com. Legally, only the brand owners themselves can issue a guarantee of authenticity but, of course, we ourselves vouch for this, with our excellent reputation, our expertise and long-standing experience. On request, we can issue an REBELLE expert’s report to confirm that the item is an original. Some vintage pieces are considered as a financial investment. In which IT-pieces should people be investing now? Chanel and Hermès are always well worth investing in. For a Birkin bag, the value can even increase by 100 per cent. For example, as Chanel increases their selling prices annually by up to 20 per cent, when reselling a handbag, you can practically get back the amount you originally paid. Otherwise, brand names such as Gucci, Dior and Fendi are very popular at the moment. There has been a new-found hype over these brands in the past three years, and, therefore, they currently hold a very good resale value. Especially old designer treasures of these brands are in strong demand these days. "My absolute favourite designer item is my vintage Chanel bag from 1990." 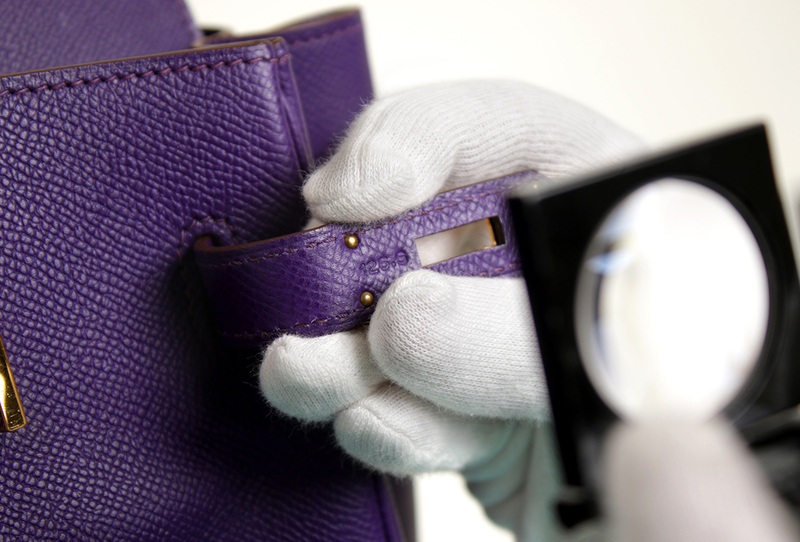 Can you still remember the most valuable handbag that you have ever examined? Yes, of course! It was a Hermès Birkin Himalaya bag for €100,000! It was made out of albino alligator leather. At the moment, we even have two of these rare models for sale at REBELLE! Are there any designer pieces that you would never sell? My absolute favourite designer item is my vintage Chanel bag from 1990. I would never give that away! How can customers connect with you? From time to time, when I am not in the office, you can find me at one of our Wardrobe Detox Events. This is where I advise customers on the condition and price of their former designer favourites. It’s always exciting to be offline every once in a while, and to be able to meet the customers personally from all over Europe!